One of Rome’s largest shopping malls, Euroma2 is located on the city outskirts and has more than 200 stores on three floors offering clothing, shoes, jewelry, home furnishings, and electronics. If you love to shop, this is an excellent way to browse hundreds of Italian and international brands all at one place. Euroma2 Shopping Experience is one of city's busiest shopping centers. As opposed to a number of other Roman designer-outlet malls, Euroma2 does not concentrate on haute couture brands, but instead features trendy sportswear brands that are widely appealing and affordable. Some are Italian or European, though many are popular American or other international names such as Apple, Calvin Klein, Foot Locker, Timberland, H&M, and Guess. 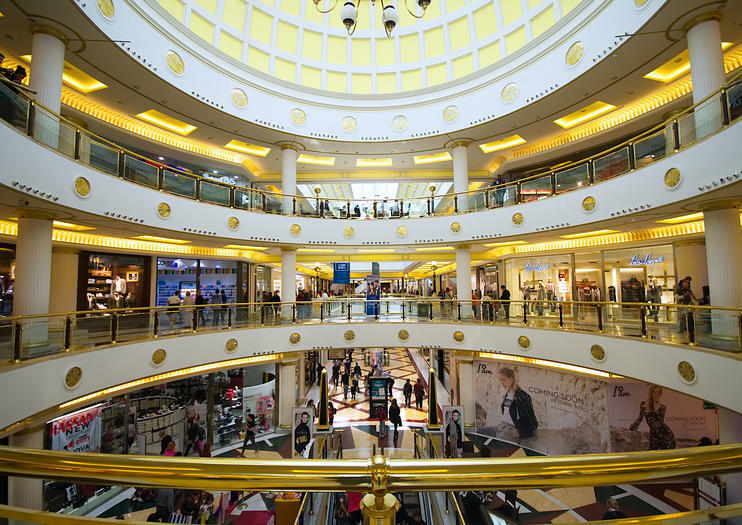 The best way to visit is by joining a guided tour that includes transportation, so you can make the most of your time and see all the stores at the mall. Small-group tours include pickup and drop-off at the Termini train station or your hotel, or you can opt for a private day tour. In addition to stores, Euroma2 has a variety of eateries from fast-food options to full-service restaurants. The mall offers free parking, a nursery, Wi-Fi, ATMs, and a cell phone charging station. The outlet center is entirely accessible to wheelchairs and strollers. All the stores in the outlet center accept credit cards or cash in euros. Euroma2 is located outside the city center on the corner of Via Cristoforo Colombo and Viale dell'Oceano Pacifico. Take metro line B to EUR Fermi, and then catch buses 070, 700, or 709 outside the metro station at the Parco Centrale del Lago to the "centro commerciale." The shopping center can be very crowded on weekends and holidays, so it's best to visit on a weekday. Italy has two main sale seasons in January and July, when you can find discounted prices. There are also regular events at Euroma2 throughout the year, including an ice-skating rink during winter. Euroma2 is located in EUR, a suburban area of Rome developed during Mussolini's reign. The area is famous for being one of the few surviving examples of Fascist city planning, and makes for striking photos.